Definition at line 2328 of file DeclTemplate.h. Definition at line 2330 of file DeclTemplate.h. Definition at line 2332 of file DeclTemplate.h. Definition at line 2391 of file DeclTemplate.h. Definition at line 2392 of file DeclTemplate.h. Definition at line 905 of file DeclTemplate.cpp. Definition at line 915 of file DeclTemplate.cpp. Definition at line 2354 of file DeclTemplate.h. Definition at line 2358 of file DeclTemplate.h. Definition at line 2340 of file DeclTemplate.h. Definition at line 2375 of file DeclTemplate.h. Retrieve the previous declaration of this function template, or nullptr if no such declaration exists. Definition at line 2365 of file DeclTemplate.h. Definition at line 2369 of file DeclTemplate.h. Definition at line 2349 of file DeclTemplate.h. 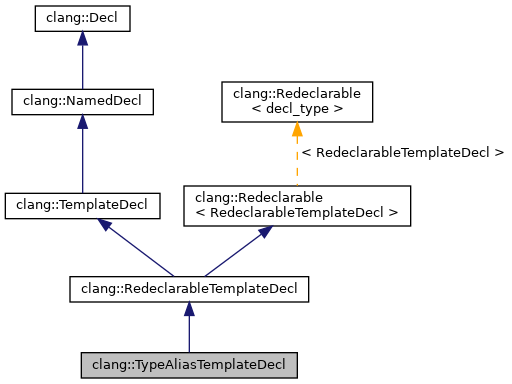 Referenced by clang::comments::DeclInfo::fill(), clang::TemplateDeclInstantiator::InstantiateTypedefNameDecl(), and clang::ASTNodeTraverser< Derived, NodeDelegateType >::VisitTypeAliasTemplateDecl(). Definition at line 922 of file DeclTemplate.cpp. Definition at line 2345 of file DeclTemplate.h. Definition at line 2346 of file DeclTemplate.h.